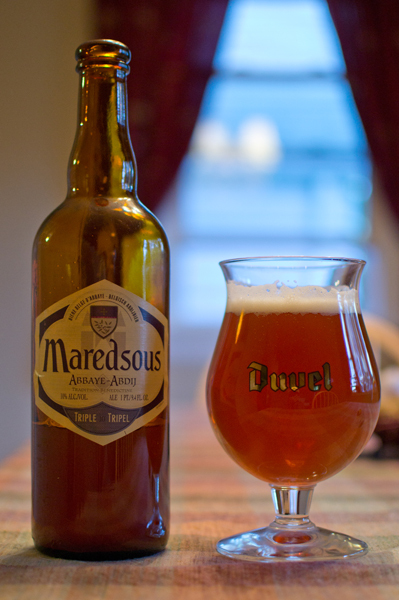 Beer #321 is Maredsous Tripel 10 by Brouwerij Duvel Moortgat NV. 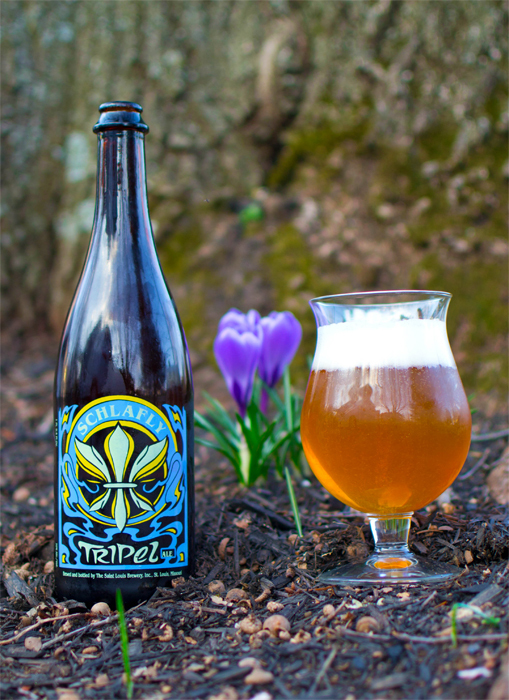 Brewed in Belgium, this Tripel has an ABV of 10%. Apperance – Hazy honey colored brew with a slightly bigger than a one finger width white head that left awesome lacing. Nose – A bit on the faint side. Grapes, apples, pepper, & that Belgian yeast aroma. Taste – A nice mix of spicy (pepper) and fruity (green apples). Mix in a some bready malts and booze near the back end. Mouthfeel – Medium body, nice tight slightly stinging carbonation. The alcohol is hidden really well here. Overall – Pretty decent Tripel. A nice slow sipping drink that kind of warmed me up on this ever so slightly cool autumn evening that had me feeling nice and happy after the last drop was drawn from the bottle. I took a look up into the sky today and was amazed by what I saw…a yellow globe radiating heat and light. Interesting…rumor on the street was that the globe was the sun. Seems like forever since it has shown itself here in good old New Jersey. Why not celebrate with some good food (Thai) and a beer. That beer, #174, is La Fin Du Monde by Unibroue and is a Tripel with an ABV 9%. This beer is from Canada and brewed in Chambly, Quebec. I do believe this is my first beer in the 365 from Canada. Sweet! Sorry for the root beer style mug this went into, but it was all the Thai restaurant we went to has for boozer like myself. They are BYOB which is a good thing. 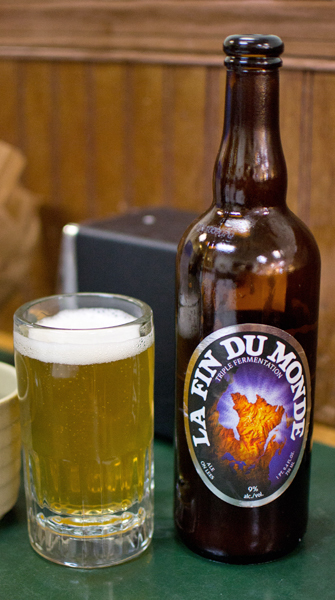 The color of La Fin Du Monde was kind of a hazy golden yellow. It had a nice frothy white head. The nose was really, really nice…apples, spiciness similar to pepper, flowery, banana, a bit of orange, and a slight grain bread like aroma. I took a taste before the spicy Thai food got to work on me. One word…delicious! Lot of stuff going on here in the taste but for me it all started with an apple like taste. Lots of other fruit (citrus, possibly peach, banana, pineapple) abound here along with a spiciness such as clove and pepper. The mouthfeel from the carbonation made it very bubbly and prickly. It had a medium body. Highly drinkable in part because of how it tasted but also because for a 9% ABV beer…that alcohol was virtually undetectable…until after the bottle was gone, then I felt it and the wife had to drive home from the restaurant. Absolutely fantastic beer that is one of the best I have had. I highly recommend you give a try. I don’t think you will be disappointed. I wasn’t and as I typed this last line, Tex (Mark Teixeira) just went deep for the Yanks with El Capitan on base (Derek Jeter) off of some hobo from Flushing, New York (Flushing…really…a town with a toilet reference…guess it is appropriate for the Mets) giving the Yanks the lead. Yeah baby! Raindrops are falling on my head…lots and lots and lots…they do say April showers bring May flowers. I sure hope it does…along with sun and warmth. 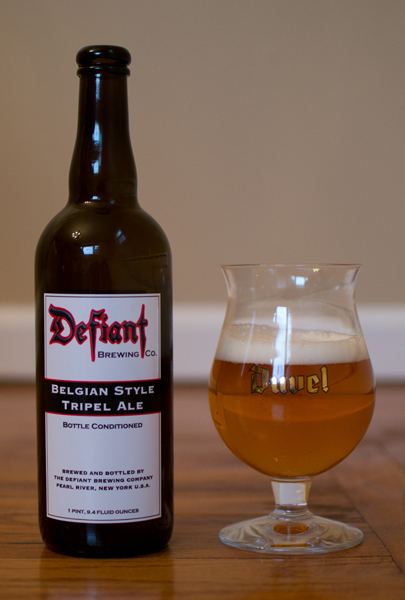 Beer #139 is Belgian Style Tripel Ale by Defiant Brewing Company from Pearl River, New York. Can you guess what style this beer is? Why a Tripel you silly sausage. This Tripel has an ABV of 9%. A beautiful golden color with a nice fluffy white head appeared in the tulip glass after I started to empty the bottle into that glass. The nose was full of yeast, cloves, pepper, and lemon. The taste was slightly sweet and a bit sour. There were flavors of banana, lemon, & apples. It was very spicy. It finished very dry with a slight bubblegum flavor/aftertaste. It had a medium body with low carbonation. The alcohol was practically undetectable making this highly drinkable. This was a nice beer but I think they got the style wrong…it smelled and tasted more like a Hefeweizen than a Tripel to me. Still, wrong style and all, it was a pretty decent beer. Cheers! Today was a beautiful spring-like day in the waning days of winter. Beer #110 is Schlafly Tripel by Saint Louis Brewery. 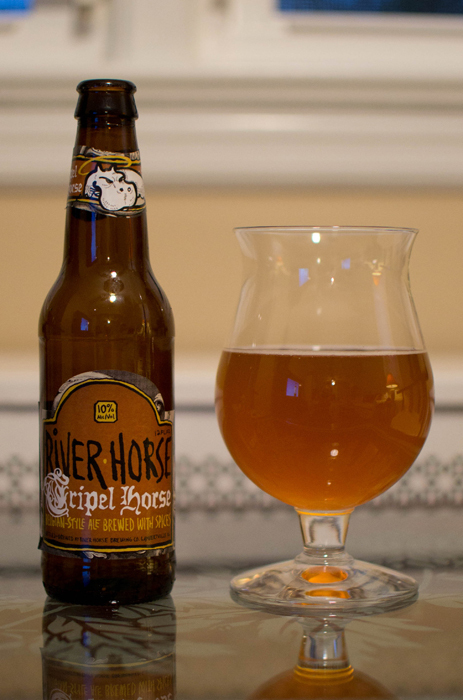 Hailing from none other than St. Louis, Missouri, this Tripel has an ABV of 10%. Out to the yard I went for the pour. Into my tulip glass went this slightly hazy golden orange brew. The decent sized head was white and thick. To the nose I went and I was rewarded with a spicy and fruity concoction. I was getting some peach or apricot aromas with that familiar Belgian yeast smell. I took a sip and the peach flavors were the most noticeable with a bit of honey thrown in there too. The spiciness comes through after the fruitiness and it finishes off with a nice hop bitterness. It was a medium bodied drink almost bordering on being thick & syrupy with a fairly good amount of carbonation. For an ABV of 10%, the alcohol is hidden fairly well. This isn’t a beer you guzzle…you take your time with this. This was a nice beer that went well with the 70+ degree day. I enjoyed this out in the fresh air sitting on my front porch as I was reading a good book…on my Nook…Color that is. Beer #105 is Trade Winds Tripel by The Bruery. 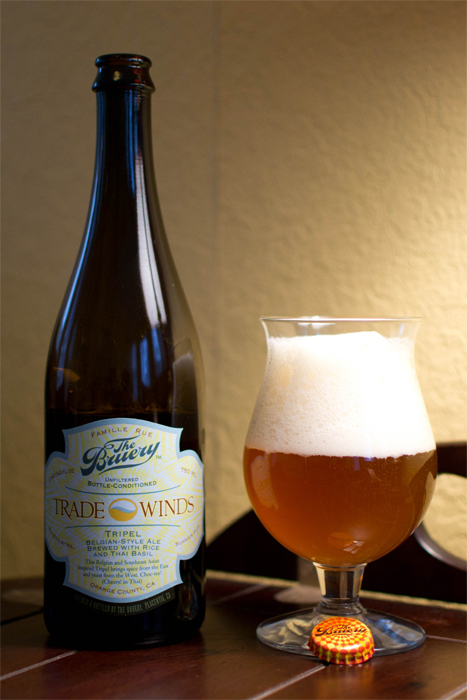 The Bruery hails from California and Trade Winds Triple is brewed in the style of a Tripel. The ABV on this beer checks in at 8.1%. The bottle says this was brewed with rice and Thai basil…interesting. Off to the 750 ml bottle we go! 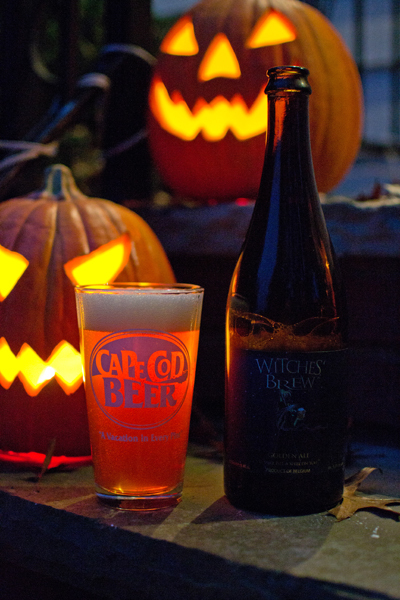 Trade Winds Tripel poured a hazy dark orange color with a huge fluffy white head. The nose was spicy, you could pick out the basil pretty easily along with a peppery aroma. There was something fruity going on in here also (think citrus) along with a nice malty aroma. I took a big sip and the spiciness hit me first along with a nice citrus flavor. There is an underlying herbal taste too, most likely the Thai basil. This was a nicely carbonated brew with a medium body. I thought the alcohol was hidden really well also. Pretty easy brew to drink…shame how the 750 ml bottle goes bye bye in no time. There was something about this beer that made me think of summer and it made me crave Thai food. Those are both things I enjoy immensely along with this beer. Choc-tee!!! That means Cheers! in Thai. Another day, another beer, another beer from NJ. I think I will make this the week of Jersey brews. A hazy amber with hints of orange with no head whatsoever stared back at me from my Duvel tulip glass. The nose was cloves, banana, & lemon with a nice Belgian spiciness mixed in. It really did taste like I thought it would from the smell. The fruity spiciness hits you first followed by a touch of alcohol and finishing off dry and bitter with a slightly fruity aftertaste. There was a bunch of lively carbonation dancing on the tongue of this medium bodied brew. The alcohol was hidden really well and to me this was very drinkable. A very nice beer indeed. It just may be my favorite from River Horse. It makes me yearn for those nice summer days where after a long bike ride on the canal towpath in Lambertville and New Hope we drop by River Horse for an after ride sampler of their brews. Good times indeed!